On November 29 CENN hosted Green Technology and Innovation Day at TechPark Georgia. 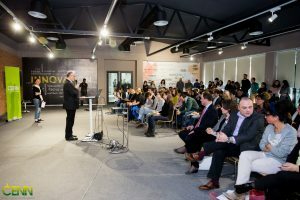 The event aimed at raising awareness of environmental issues throughout Georgia and introducing green technologies and innovative approaches to the audience. At CENN we believe that using modern technologies both in Georgia and worldwide will make it easier to spread information about environmental challenges and increase community participation in bringing about lasting positive change. During the event, CENN unveiled the first ever environmental knowledge portal for the South Caucasus, a mobile application — GreenWatch and an educational e-game, Sort and Recycle. The Caucasus Environmental Knowledge Portal (environment.cenn.org) is a platform that provides updated information to stakeholders on all kinds of environmental issues. The platform encourages public participation in environmental decision-making by providing readily accessible and relevant information to arouse public interest in environmental issues. The portal makes scientific and policy-based information and popular articles available for anyone interested in the environment, both children and adults, concerned stakeholders and people already involved in environmental activities. The Platform was created by CENN with financial support from our donors. The mobile app GreenWatch is another innovative tool created by CENN, which allows us to care for nature together. The app lets users highlight specific threats to the environment by sending information to CENN and other relevant actors, using easy taps and gestures. Taking advantage of faster, more modern means of communication, the app will bridge the gap between the public and government, helping them to work together to take care of the environment. The app was created in partnership with the Ministry of Environment and Natural Resource Protection of Georgia and Tbilisi Municipality City Hall, with financial support from CENN’s donors. An educational e-game Sort and Recycle was created for the purpose of raising public awareness on waste separation and recycling, targeting children aged 6 and above. The goal of the game is to help the younger generation understand that not all waste is garbage, that it’s possible to produce useful items by sorting waste and further recycling and that by recycling waste, we care for the environment since we save natural resources. The game, conceived of and supported by CENN, was developed by GeoLab, in the framework of the USAID-funded program “Waste Management Technologies in Regions”.